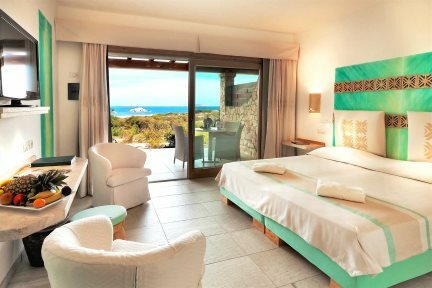 Resort Valle dell’Erica is tucked away in one of the most beautiful corners of Sardinia and occupies a privileged site by the sea, affording spectacular views across the Straits of Bonifacio on one side and to the islands of La Maddalena on the other. The scenery is truly captivating and can be enjoyed from almost everywhere within the complex, whether you are on the breakfast terrace, lazing by the pool or even from your bedroom (upgrade supplements apply). 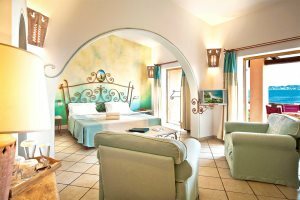 Set in extensive grounds, the Resort Valle dell’Erica is split into two hotels, Hotel La Licciola and Hotel Erica. Both hotels enjoy a range of superb shared facilities, while large Mediterranean gardens filled with scented herbs, time-sculpted granite rocks and a string of sandy beaches lapped by crystal blue waters give the resort a sense of tranquillity and natural wonder. Exclusive, informal and with a good range of amenities on-site including pools, baby and children clubs as well as a first-class thalasso and spa centre, the hotel attracts both couples and families alike. The hotel, ‘La Licciola’, within the complex offers modern rooms and interconnecting family suites, as well as a large sea water swimming pool. In addition to these rooms there is an ‘exclusive area’ reserved for guests over six years old which has its own freshwater pool – perfect for those wishing to get away from the little ones. Porto Pozzo with its harbour and water sports is only 4km away and the picturesque village of Santa Teresa Gallura is also very accessible. 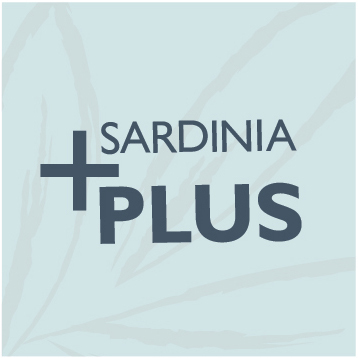 Alternatively, the resort offers a good range of excursions and activities for guests to discover Sardinia in all its splendour! Find out more about the rest of the Delphina hotel collection. Seven restaurants (five in Erica area, two in Licciola area, available to guests of both hotels). Five bars, four swimming pools (one for children), children’s mini-club (ages 4 to 9), children’s activities (ages 10 to 13) with mini five-a-side football pitch, canoe excursions. ‘Exclusive area’ at Hotel La Licciola: fresh water swimming pool. Wi-Fi available in the whole resort and on the room terraces..
At a supplement and payable locally: Thalasso and spa centre ‘Le Thermae’ including four outdoor pools, 15 treatment cabins, Turkish bath, sauna, relaxation area and cardio-fitness room, baby club from 21/05 (12 to 36 months), golf lessons, excursions, boat trips. En-suite shower room, television, telephone, mini-bar, hairdryer, safe, air-conditioning, covered terrace with patio furniture, sea view available at a supplement, also there is a choice of rooms that can interconnect (on request). 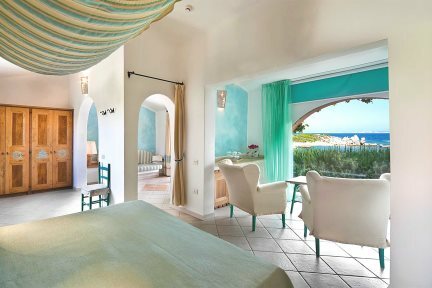 Classic Sea View Rooms are decorated in a Mediterranean style by expert local craftsmen, with a double bed for two adults. They have a delightful terrace or balcony with sea views and a small table and chairs. A more spacious room than the Classic Room, with a double bed (twin beds on request) for two adults plus the option of sleeping a child from 0-1 year old in a cot. 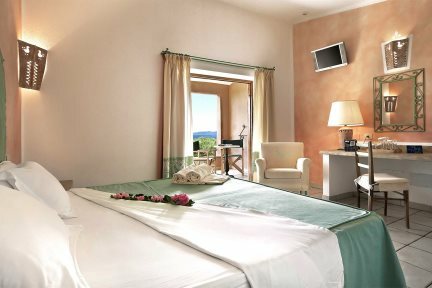 The Superior Room is complete with a veranda with stunning sea views and a small table and chairs. Superior Rooms are 29m². They have a double bed (twin beds available on request) and are furnished in a typical Mediterranean style, equipped with a delightful terrace or balcony with stunning sea views and a small table and chairs. These bedrooms are for two adults with the option of sleeping a child aged from 0 to 1 year in a cot. Junior Suites Mirtilla are 41m² and furnished in a typical Mediterranean style. They feature a double bed (twin beds available on request) and an elegant open plan living room with two armchair beds. 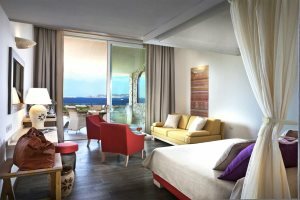 The Junior Suites are complete with a delightful terrace or balcony with sea views and a small table and chairs. Bedroom for two adults with the option of sleeping two children from 0 to 11 years old. 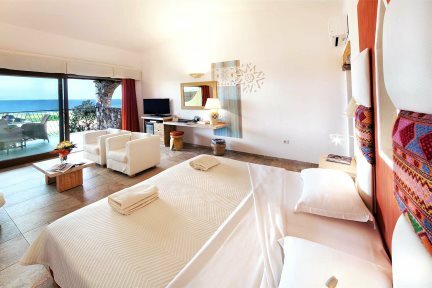 Elegant room with double bed (separate beds available on request) and charming open-plan living room with built-in sofa bed or single armchair bed facing a large panoramic veranda with sea view. Bedroom for three guests with the option of sleeping a child from 0 to 1 year old in a cot. Even while having a shower you can enjoy the view which sweeps across the whole La Maddalena Archipelago or the Mediterranean gardens, thanks to the little window in the bathroom. 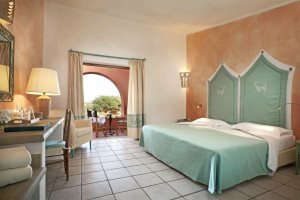 The headboard is decorated with valuable hand-woven fabrics in bright colours that come from the heart of Gallura and which also appear on the walls in a variety of colourful patterns.